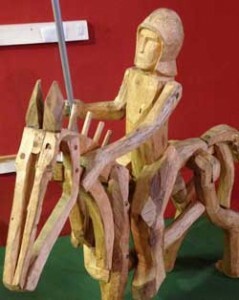 The story of the Battle of Tewkesbury is complicated and hidden by legend. 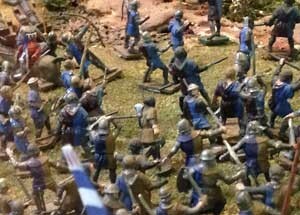 Our display tries to tell the story in a straightforward way, describe some of the context of the battle and the part it has played in the story of Tewkesbury. The ‘star’ of the display is our battle diorama. It was made in 1971 to mark the 500th anniversary. It was designed by members of the Richard III Society, and built with lots of local assistance. The original model was constructed in situ in the room which now houses the fairground display. 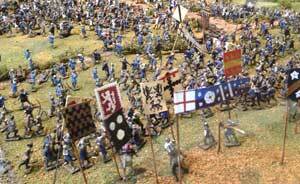 It was made using over 2,000 figures from the Airfix ‘Robin Hood’ and ‘Sheriff of Nottingham’ collections. Each tiny model was adapted by cutting and gluing for its specific role, and then was hand painted with the livery of the household it was to belong to before being carefully pinned into the landscape. The effect is striking, and the detail mesmerising. There is extensive use of heraldry and livery colours, which make it possible to identify groups and individuals. When the model was loaned to Gloucester Museum, soon after construction, the problems of the way it was made were realised. It could only be moved by cutting the base, and what came back was the cropped version displayed today. From 12ft x 6ft it has reduced to 8ft x 4ft. It has lost nothing of the battle, but some of the wider landscape, and particularly depictions of ‘set piece’ events which were displayed and explained have, unfortunately, gone forever. Tewkesbury has made a great deal of the heraldry of the battle. A great deal of research has been carried out into the arms and the families which bore the arms. Much of this is available both in the form of heraldic painting done fifty years ago displaying the arms of the principle combatants and also in a paper database of all the known participants, with ever-growing biological information. This is available to browse, or research. On a different scale and of more recent vintage are the maquettes (models) which were the initial designs for the ‘Arrivall’ commemorative sculpture which graces the Stonehills roundabout on the town’s southern boundary. These were made by the sculptor at 1:100 scale to present the concept to the Tewkesbury Battlefield Society, the sponsor’s, who displayed them for the years before consent was received, and to explain the ideas to planners, highways officials and structural engineers. Once consent was obtained, they became the sculptor’s working drawings, being trundled through the forest looking for suitable oak boughs. They are now in retirement, as part of the story of how the Battle of Tewkesbury continues to affect the town.